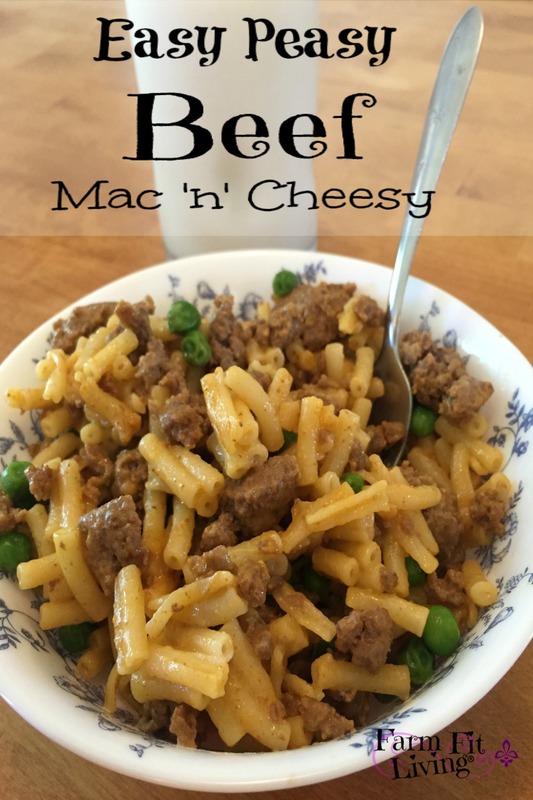 Are you looking for a recipe that is simply easy peasy beef mac ‘n’ cheesy? 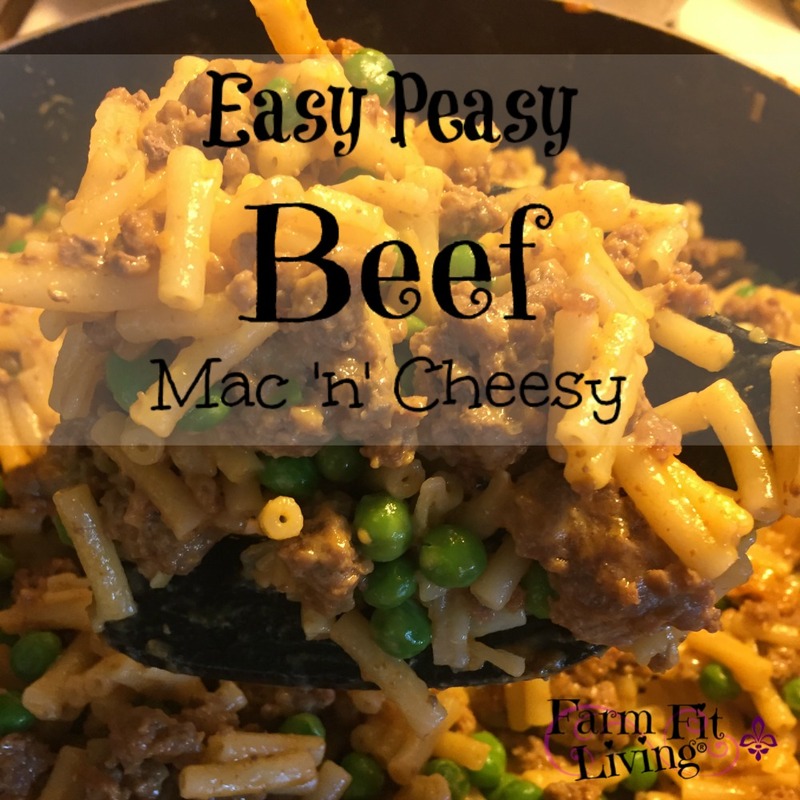 Easy peasy beef mac ‘n’ cheesy is all that is deliciously simple comfort food. A complete mixture of hamburger, noodles, cheese and peas are packed into every yummy bite. The secret to a good life is finding balance. Even people like me who strive to be self-sufficient require convenient options once in a while. And there’s nothing wrong with that. We are all human. Easy peasy mac ‘n’ cheesy isn’t a new recipe for me. My mom and dad used to make this recipe years ago for my siblings and I in between busy activities. The use of Kraft macaroni ‘n’ cheese makes is so easy. You know…The liquid gold in the blue box. It is a delicious treat every once in a while. I keep Kraft on hand for times when I need something quick. I do enjoy to make macaroni and cheese homemade, but it takes a little bit more time. Peas are a delicious and sweet addition into the dish but they can definitely be substituted with another veggie. I like to use peas from my garden. But since pea season is so quick, I use frozen peas many times. So, easy peasy beef mac ‘n’ cheesy needs to be shared to the world. Everyone loves it! I know you will, too. Here’s the recipe for easy peasy beef mac ‘n’ cheesy. Bring a pot of water to a boil. Once the water is boiling, add the noodles. Cook until soft, then drain. Meanwhile, brown the ground beef in a skillet until fully cooked. Drain grease. Add the noodles into the skillet with the beef, along with the cheese packets and milk. Mix well with heat until combination is fully covered with cheese. Finally, add the peas. Cook on low heat until peas are soft. Enjoy. Makes plenty of leftovers. Fresh Ground Beef – My family and I raise our own beef for our freezer. Beef is loaded with protein and nutrients and other nutrients to keep our bodies balanced and nourished. Our calves are born either in the spring or the fall. We wean them at 5-6 months old and feed them a grain mixture. The grain mix contains corn we grow ourselves. The calves are fed for several months. When they are 700-800 pounds, we sell all except for one or two calves we will feed longer to harvest ourselves. The weight goal for a market beef animal is 1200-1300 pounds. When it’s ready to be harvested, we take it to the local locker plant to harvest for us. A few weeks later, our beef is ready to be picked up. We usually have around 800 pounds of hamburger, steaks, roasts, brisket, and more. Garden Peas – I plant my pea seeds in the early spring. March is the target month for the early spring garden planting in my gardening zone. As the peas grow into plants, I maintain them by watering and weeding. Peas love to climb, so I install trellises to keep the plants off the ground. I also mulch the peas with straw to help with the weed control. Then, once the pods are set and filled, they are ready to be picked and podded. Podding peas can be a tedious task but with practice, one can be very good at it. They can be blanched in hot water and then cold for freezing. My favorite way to eat peas is fresh. Easy peasy beef mac ‘n’ cheesy is a delicious ways to eat fresh peas. There’s nothing wrong with convenience. Even when it comes to food. Sometimes you just have to get out the blue box. Why not add in a veggie and some delicious farm fresh meat? It’s a great way to make a healthier quick meal in the midst of a crazy lifestyle.